Our experienced service technicians will provide the following 15 point precision tune-up, professional cleaning and safety inspection services. Proper adjustment and cleanliness of blower and components necessary for adequate air flow to ensure your furnace can deliver maximum heating capacity and efficiency. Safety controls are essential for proper protection of the unit and your family and will be adjusted to factory specification. Our trained Serviceman will assure that the heating system is cycling on and off properly and that controls are calibrated to factory specifications. Proper gas pressure to the burners will ensure the most efficient and safe burner operation and reduces energy costs. Dirty heat exchangers and burners reduce the heating efficiency and capacity of your furnace. As your furnace gets older, there is a real danger of cracks developing in the heat exchanger. These cracks can allow dangerous products of combustion (including carbon monoxide) to enter the fresh air of your home and endanger your safety and the safety of your family. We will thoroughly inspect your heating system visually to determine if this hazard is evident. An obstructed flue can cause products of combustion to enter your home and endanger your family’s safety. The heat anticipator in your thermostat determines how often your furnace cycles and will effect the cost of operations as well as the comfort level in yourhome. 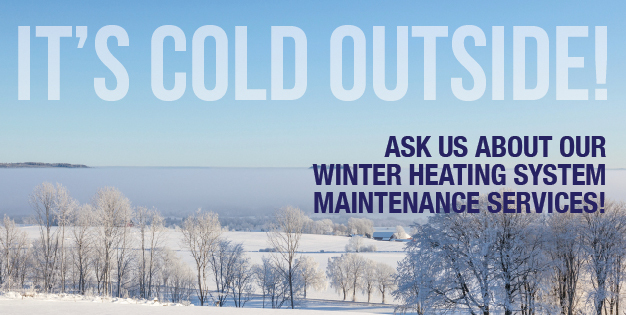 A properly adjusted pilot will assure that your furnace will start reliably all winter. Properly adjusted blower speed will ensure you of efficient and reliable furnace operation and comfort. Poor lubrication causes drag in the motor and drive shaft thereby, requiring more electricity to overcome resistance. Lack of lubrication can burn out a bearing motor. To improve the operating efficiency of your heating system. Click below to learn about our cooling season planned maintenance.